What colors are availiable for wrought iron? At Linmoore Fencing, we provide a variety of color choices for our custom wrought iron fences, gates, railings, and handrails. Wrought iron is most commonly seen in shades of black and gray, and we can help you find the exact shade that will best suit your needs and complement your home’s or business’s architecture and design. White is a wrought iron color that evokes antiques and old-fashioned elegance, and many of our customers love the look of white wrought iron. Of course, white shows dirt, which has its pros and cons: on the plus side, you can see when there is dirt on your wrought iron so that you can clean it off before it damages the finish and begins to allow moisture to damage your valuable wrought iron; but on the minus side, when it gets dusty it no longer has the sparkling white appearance that so many people love. If you want a very natural, earthy look to your wrought iron, we even offer shades of brown and tan for your fence, gate, railing, or handrail. 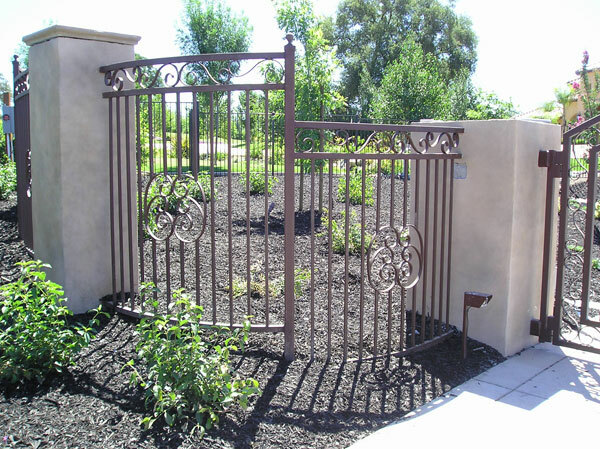 Of course, if you want a completely unique look, you can talk to us about any other unusual colors for wrought iron, and we are happy to accommodate special requests and orders for any of the more uncommon colors in wrought iron. Basically, the bottom line is that we can do whatever color you want for your wrought iron fence from Linmoore Fencing. Most commonly, people choose black or a dark gray for their wrought iron, as this shows up spectacularly against any color of home, pairs beautifully with brick and natural stone, and is easy to see from the road. After all, wrought iron is only half about functionality; the other half is about showing off, making your home look gorgeous, and giving your neighbors something to be jealous about. White fences are actually very popular in wrought iron, evoking the white picket fence aesthetic, and we are certainly happy to accommodate requests for other, more exotic colors as well. Give us a call for a free estimate on your wrought iron fence, railing, gate, or handrail!